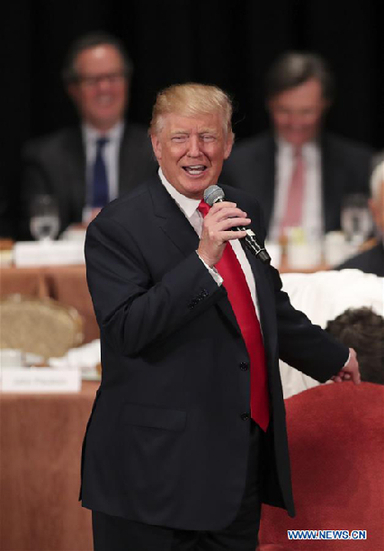 U.S. President-elect Donald Trump is rhetorically committed to getting tougher with the U.S. trade policy towards China. If implemented, U.S.-China trade relations would undoubtedly suffer big losses on both sides. It's pretty clear that during his presidential campaign Mr. Trump won strong support from manufacturing districts suffering job losses due to diminished traditional manufacturing enterprises by promising to create jobs and bring outsourced jobs back to America. He also promised to impose high tariffs to block Chinese exports into the U.S. market. However, restricting trade will do little to create manufacturing jobs. First of all, the trend of globalization will continue as a feature of the world economy. Emotionally, it is understandable that manufacturing jobs in mills symbolized the American dream. But manufacturing has entered into a high-tech and robotic stage. Many low-skilled, traditional manufacturing jobs have become obsolete and will never return to the U.S. Furthermore, outsourcing is a business strategy, not a national strategy. President Obama pushed very hard, but failed, to bring outsourced jobs back to America. But now he too has to acknowledge that most manufacturing outsourced jobs are probably never coming back. Indeed, neither trade deficits nor outsourcing have yet disadvantaged American economic competitiveness in terms of either high-tech innovation or high-end manufacturing capacity. Tougher trade policies cannot bring jobs back from the past. Instead, workers have to be retrained for the future. Second, import trade can create jobs, too. For decades, low-cost imports have helped to keep the inflation low and make commodities affordable to American consumers. Economists have conducted a fair amount of research and have proven that cheap imports contribute to the financial well-being of American households. Nothing at Wal-Mart or Target is 100 percent "Made in China." In fact, the U.S. content of "Made in China" products is about 55 percent, as shown in a study by the Federal Reserve Bank of San Francisco. Moreover, the U.S. economy is a consumer economy. Imports represent the value of trade in goods produced overseas by a trading partner, but they also add domestic value through service-sector employment. The latter may give a much greater benefit to America than an imported product's stated market value. Third, U.S. trade with China is more interdependent than ever. History has taught us that better bilateral trade relationships are good for all. Global economic stability now depends highly on the sound development of the world's two largest economies. Trade is not just about imports and exports; it is about economic policy, financial stability and foreign policy. Any trade restrictions could immediately cause trade wars and lead to worldwide financial chaos. If financial markets react quickly, the economy will most likely go into a deep recession, and the cost in jobs alone would be catastrophic. There are two markets in the U.S. trade policy-making scenario: the economic market and the political market. As an entrepreneur, Mr. Trump is reputed to have tremendous experience related to business management in world markets. However, in the political market, cooperation is not optional - it is a necessity. Commercial diplomats and trading nations work to seek mutual trust and build bargaining power through "co-petition," because neither isolation nor retaliation is sustainable. As a viable alternative, "co-petition" means building economic statecraft by integrating cooperation and competition. The U.S. trade policy is influenced by numerous stakeholders. Congress has the authority to pass trade laws and regulations as guidelines for the executive branch to conduct and implement trade policy. Also, the President-elect's trade policy is still in the process of formulation. Nevertheless, available presidential powers to restrict trade are still strong enough to initiate protectionist trade policy, such as applying safeguard measures and antidumping tariffs. To be fair, his real intentions in terms of trade actions are not clear, but at this time the President-elect seems unlikely to reframe from exercising at least some restrictive trade authority. On a positive note, Mr. Trump has taken on many new roles in a fairly short transitional period since the election. And, traditionally, trade policy has always been used as a convenient vehicle to gain votes. Therefore, we have reason to expect Mr. Trump to deviate somewhat from what he promised during the campaign season. This would be consistent with other U.S. presidential elections. Most modern candidates have taken advantage of the China factor in order to win their respective elections. But as soon as they are sworn into office, rational trade policy choices become available. In conclusion, if U.S. trade policy adopts protectionism, the threat of recession could become very real. Instead of creating jobs, trade protection and trade restrictions can only create trade conflict and further destabilize the world economy. With all the worries and concerns, both politically and economically, let us hope that the new administration embraces trade promotion and liberalization. Donald Trump's proposed trade policies could have a destabilizing effect on both the U.S. and the global economies.